is an important thing to know if you are interested in zooming in on the source of evil in this world. 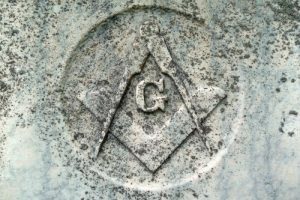 Centuries of leaked documents, former insider accounts and scholarly research has shown that Freemasonry has become the most pervasive, influential and powerful of all the Secret Societies on Earth. Many US Founding Fathers were masons. Many leading figures of the French Revolution were masons. Many US presidents have been masons. Freemasonry inspired Mormonism and was a central theme behind the occult assassination of JFK. People in high positions of power place their oath to Freemasonry above their oath to serve the people who elected them; some such policemen and judges make decisions not based on truth and justice but rather based on protecting the masonic network, the Lodge and their masonic brethren. Many lower level masons are deliberately kept in the dark, not told what they are getting into, but what are the higher level initiates really worshipping? 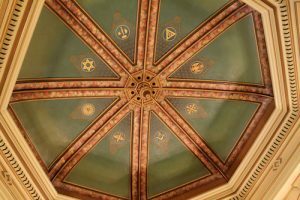 Who or what is the god of Freemasonry? In trying to decipher the god of Freemasonry, there are many clues that point towards a dark force that is the engineer or creator of this world, especially the dystopian aspects of this world which some people have dubbed The Establishment, The System or The Matrix. It is no coincidence that in The Matrix movie series themselves, Neo finally meets his maker, i.e. the being who created the entire system. He is called “the architect” and is represented by a bearded old man. Saturn, god of time, harvest, law and death, is also represented this way. 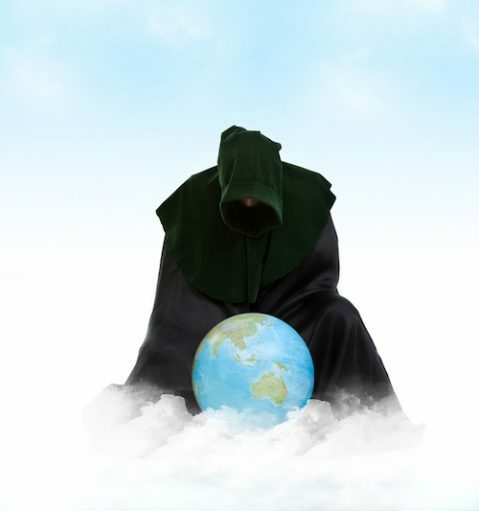 Masons typically refer to their god as the “Great Architect of the Universe” while Gnostics also used the same term in reference to the tyrant they claimed had created a fake, inferior copy of the original perfect world (they also called this force “Demiurge” and “Yaldabaoth”). The primary masonic logo of the letter G is enclosed inside a square and compass, which are tools of an engineer, draftsman or architect who designs and draws with them to create things. 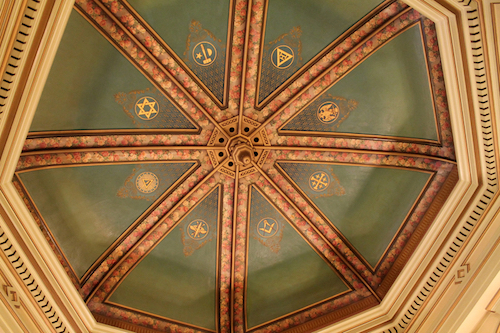 Ceiling of masonic lodge in Philadelphia. It’s easy to get lost in names here, but the point is to see the connections. There are many names but one underlying force beneath all the names. The Architect/Demiurge is the cruel god who is basically the same force as Satan or the Devil, and goes by many other names, as we shall see. Is the God of Freemasonry Jahbulon? 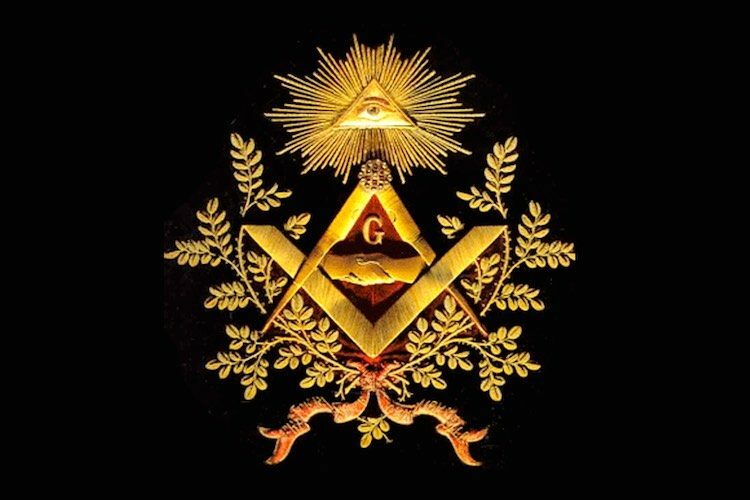 Historian Jasper Ridley claims in his book The Freemasons that before joining a lodge all Masons must accept that the God of Freemasonry is Jahbulon and that they learn this once they get to the Royal Arch Degree. Interestingly, Jahbulon is a composite word made up of 3 parts: Jah is the Hebrew name for God (Jahovah is very similar to Jehovah) and is also used by certain Rastafarian religions to mean God; Bul refers to the Babylonian deity Baal; and On refers to the Egyptian deity Osiris. Statue of George Washington, 1st US President and high-level Freemason, in a Baphomet pose. Baphomet is another god associated with Freemasonry, even though some Freemasons officially deny it. 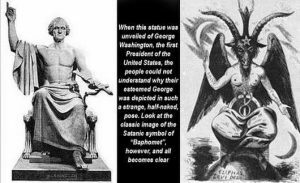 You can see master mason George Washington doing his baphomet pose above. Baphomet was a hermaphroditic god (having both male and female genitalia) which will begin to take on more significance in the future, as we head into a transhumanistic world where the NWO transgender agenda (part of the synthetic agenda) is to make all humans more robotic – non-binary, genderless and sexless. Baphomet’s head is an inverted 5-pointed star/pentagram (more Satanic inversion), and being a goat he is linked to Mendes, Pan (god of the wild, often linked to horniness and sexual excess), Capricorn (the zodiac sign symbolized by goat horns) and of course Saturn (housed in Capricorn in the night sky). Blatant: Manly Hall writes of the “seething energies of Lucifer”, the God of Freemasonry. If lucifer were not god, would Adonay (the God of the Christians) whose deeds prove cruelty, perfidy and hatred of man, barbarism and repulsion for science, would Adonay and His priests, calumniate Him? Yes, lucifer is god, and unfortunately Adonay is also God, for the eternal law is that there is no light without shade, no beauty without ugliness, no white without black, for the absolute can only exist as two gods. darkness being necessary for light to serve as its foil, as the pedestal is necessary to the statue, and the brake to the locomotive. The God of Freemasonry: responsible for the fake light that initiated the Simulation/System/Matrix we inhabit. Worship of the “Light” … But What Light? Which it calls “light” – indeed. The open admission by esteemed masons that the God of Freeasonry is Lucifer (and concomitantly that the ideology of Freemasonry is Luciferian, that the goal of Freemasonry is to become enlightened) is itself another inversion. The light is not what you think it is. In this context, light is not synonymous with good, pure, moral or love. Remember, Freemasonry extolls the virtue of intellect and knowledge represented by the light. They worship Prometheus, the mythological figure who stole fire from the gods and gave it to mankind (a statue of Prometheus can be found outside the Rockefeller building in New York). Not coincidentally, in another of his myths, Prometheus establishes a form of animal sacrifice that was practiced in ancient Greece. The evidence that Freemasonry is a negative force is overwhelming. The Illuminati are a group of cold-hearted psychopaths, eager for power and control at any cost, and are the furthest thing from enlightened or illuminated in the normal and common sense of the world. To be truly enlightened or illuminated would be to realize that we are all one, we are all connected, that whatever you do to another you do to yourself, and that therefore empathy for others is a natural extension of love for yourself. The attitude of high-level manipulative Secret Society initiates is just the opposite of this. The light of Freemasonry is a fake light, which has given birth to a fake reality. The light is the start of the Matrix. “Let there be light …” can be interpreted as the story of creation of the inverted, dystopian world in which we live, designed and created by the same negative force with many names that I am exposing throughout this article. The light has been weaponized. This is, of course, intimately connected to the widespread idea that we live on a prison planet, trapped through karma (ruled by Saturn, god of time), where (unless we elevate our consciousness) we may not be able to escape a soul net or reincarnation cycle – which works by introducing a fake light at the point of death to entice our souls to rinse and repeat ad infinitum. Read Soul-Catching Net: Are We “Recycled” at Death to Remain in the Matrix? for a deeper explanation. What is most important is to see the deeper unity of reality, to connect the dots among seemingly disparate names, terms, ideas and cultures. Whether you call this dark force the Great Architect of the Universe, the Demiurge, Yaldabaoth, Satan, Devil, Yahweh, Jehovah, Saturn, Jahbulon, Baal, Nimrod or Lucifer, it’s the same basic force. Rich and powerful people are worshipping something – and they’re not just doing it for fun. They’re getting something out of it. They are literally selling their souls – handing them over for possession – in exchange for (what they perceive as) power, but which in reality is a diminishment of their power.